Our estate and the surrounding area has a rich and fascinating history. For thousands of years its most important feature was that it lies in the valley of the River Fleet. The last stretches of the rivers were diverted into sewers in the 19th century, but a few modern enthusiasts have been able to follow the river which still flows underground. But you can still see a few signs of the river’s earlier glory. Hampstead Heath is full of little ponds and streams which all lead to the two sets of ponds and then into sewers. There are two main sources, one in the Vale of Health and the other in the grounds of Kenwood House. The latter is considered to be the official source, being furthest from the Thames. Though academic opinions differ, the most popular view is that the two branches meet somewhere close to Camden Gardens, next to the railway bridge which crosses Kentish Town Road. In modern terms the river flows across to and under Sainsbury’s, along Lyme Street and on to the end of Pratt Street. The Feet then goes downhill beside St Pancras Way. If you walk down to College Grove you can clearly see the dip in the ground which shows the old course, behind the Royal Veterinary College. The river broadened out into what was called Pancras Wash, because it often flooded, in front of Old St Pancras Church. It then flows on to Kings Cross and Farringdon Street. The valley is very obvious at the bottom of Fleet Street. It comes out into the Thames at Blackfriars bridge, where you can see the entrance to the sewer from the river. In the late 17th century a tusk was found – sadly it disappeared sometime within the next 100 years. At that time it was believed to have been from an elephant used by the Roman army. But it is now agreed that it was probably a mammoth tusk. So there were mammoths in Elm Village. A full review of the flow of the present day Fleet River. Many people have heard the stories of Julius Caesar crossing the Channel in 55 BC. 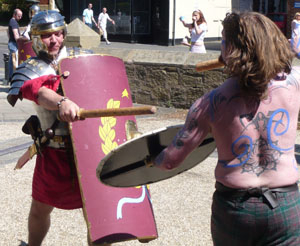 Most of us particularly like the account which describes our ancestors, painted with woad, striking fear into the hearts of the legendary Roman legionaries. However, the real history of the Roman occupation began with a determined war of conquest by the Emperor Claudius in 43 AD. 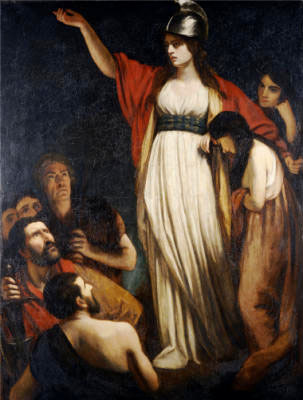 pronounced Boudicca, but whom we usually call Boadicea. You can see a picture on this page of this fiery woman, though it is more inspiring than accurate. Legend has it that her last battle was at Battle Bridge – roughly where the gas holders near King’s Cross used to stand. She was killed, and the legend continues that she was buried under what is now Platform 10 of King’s Cross station. Unfortunately the accounts of Roman historians make this unlikely. It is also worth visiting the Museum of London to see their recreations of Roman life. Though no villas have been found in this area, it is almost certain that Romans walked through our estate, since there must have been farms which provided Londinium with food. The nearest known Roman roads are the A1 (Archway Road) and the A5 (Edgware Road). But it seems clear that what are now St Pancras Way, Camden High Street and York Way must have been well used tracks. Also traders are likely to have used the River Fleet. The mouth of the river was a major landing area for shipping, and small craft were certainly able to come up as far as modern Kentish Town. An anchor (not Roman) was found in the bed of the river behind the Castle Inn (now The Flowerpot). In 410 AD Rome came under attack from the Visigoths, a Germanic tribe led by their king, Alaric. The Roman legions were recalled, and never returned, so leaving Britannia (their name for our country) open to other predators. St Pancras. One day lad, this church and train station will all be yours. If you are looking for pure historical fact, read no further ! – many of the events described below have been disputed by historians. But let’s not spoil a good story for the sake of the truth. 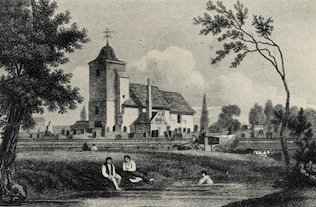 When the Roman occupation began in 43AD, the site now occupied by St Pancras Old Church was sacred to the pagan Britons because of its wells, which were said to have medicinal qualities. When Christianity arrived, such sites were taken over, so that their spiritual associations became associated with the new religion. It has been claimed that St Old Pancras Church is the oldest in London, having been founded in 314 to commemorate the death of the child martyr Pancratius in Rome in 303 A.D. Another story claims that the church was founded by St Helen, the mother of the Emperor Constantine, when he declared Christianity to be the official religion of the Roman Emperor. We don’t know if Christian worship continued on the site after the arrival of the pagan Anglo-Saxons from 410AD onwards. To understand the next phase we need a little international history. According to legend, in 595 AD Pope Gregory visited the market in Rome, where he saw slaves on sale. He was struck by the beauty of their blue eyes and their golden hair shining in the Italian sun, and asked where they came from. The merchant replied that they were from Britain, and were Angles. In a flash of papal wit Gregory replied “Not Angles , but angels”. On hearing that they were pagans, he decided to send a Roman prior, Augustine, to go to Britain and convert the heathens who lived there. In fact, the truth seems to have been a little less glamorous. The Pope was anxious about the growing influence of the Celtic Christian church in Britain. The King of Kent , Ethelbert, had married (or was persuaded to marry for political reasons) Bertha, daughter of the King of Paris. She was a Christian and was allowed to keep her faith. Kent therefore made an excellent base for Gregory’s plan to return Britain to the authority of Rome. Augustine certainly had a great effect, since some 10 000 Kentish pagans are said to have been converted on Christmas Day, 597. Whether this was due to spiritual enlightment or pressure from Ethelbert is not known. The religion spread, and the missionary Mellitus is credited with creating the first version of St Paul’s Cathedral (a small wooden building) in 604AD. So it is possible that our local church was refounded at this time. It is said that Gregory gave Augustine relics of St Pancras to take to England, and that the first church consecrated by Augustine at Canterbury was dedicated to the saint. Pancratius was the son of Roman citizens and was born about 289AD in Phrygia. His mother died during childbirth, and his father died when Pancras was eight years old, so the boy went with his uncle to live in Rome. They converted to Christianity, and Pancras became a passionate believer. During the persecution of Christians in 303 AD, he defied an order ordered by the authorities to perform a sacrifice to the old pagan gods. It is said that the Emperor Diocletian was impressed with the boy’s refusal, and tried in vain to persuade him but finally Pancras was decapitated on the Via Aurelia, on May 12, 303 AD. According to another story, Pancras was put into an arena with a panther, which refused to attack the boy until Pancras gave it permission! Don’t try this today. At one time you could go for a dip in the Fleet just opposite St Pancras church. exists today in the Basilica of San Pancrazio. The festival of St. Pancras is held in the Roman Catholic Church on 12 May. In art, St. Pancras is always represented as a boy, with a sword in one hand and a palm-branch in the other. He is a patron saint of children. Pancras can be appealed to in cases of false witness, perjury, cramp, and when you have a headache. So instead buying aspirin, you can always ask St Pancras for relief. There are no maps giving us clear boundaries, but the general opinion is that Elm Village lies on land of Cantelowes Manor. From the Domesday Book, we know that St Pancras was in in the Ossulstone Hundred (an administrative unit) – now remembered in Ossulston Street. There were 35 households (that is men who were heads of a family), so there were in fact probably 100 to 200 people. (Elm Village has 150 residences (households) so the population was probably about half that of the estate). The area consisted of “meadows, pasture and woodland”. We can only speculate whether the Elm Village area had been cleared by then. We know that the population was of Saxon origin from the place names, notably “– ton” (modern “town”), hence Euston, Islington. The manors originally belonged to Saxon noblemen, but were given to the Canons of St Paul’s Cathedral, for whom they provided at that time an income of £3 a year. It is very hard to get an accurate estimate of what this means. Different sources suggest that £1 at that time is worth £783 to £33 000 in modern terms. We do know that if Canon Walter had wished to buy a female slave it would have cost him between a sixth and a third of his annual income – but if he had raped her, records of fines suggest that he would have had to pay two years, rents (clergymen in those days were not always as moral as they are today). Details of this type of calculation. We think of Saxon men as wild and crude, swigging gallons of mead before fighting and fornicating. But archaeology shows is us that they had a remarkable level of craftsmanship. Acres bountiful bringing to harvest/Tall stalks and shining growth/Acres of broad harvest of barley/Acres of white harvest of wheat/And all the harvests of earth. Were the Saxons ploughing Elm Village centuries before Lord Agar build his Lodge here? And our ancestors were not without humour. They liked riddles. So what is this one talking about ? no citizen except my slayer. Rooted I stand on a high bed. I am shaggy below. Sometimes the beautiful peasant’s daughter, an eager-armed, proud woman grabs my body, rushes at my red skin, holds me hard, claims my head, confines me in a strong hold. The curly-haired woman who catches me fast will feel our meeting. Her eye will be wet. 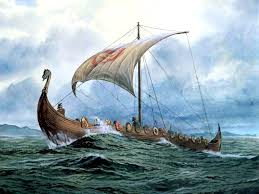 The Vikings lived in Scandinavia but from the 8th Century they used their longships to sail to places as far apart as Newfoundland and Turkey. They are perhaps most well known as raiders who launched brutal attacks on the countries they went to. But this was followed by trade and then settlement in many cases. Their contact with Britain followed the same pattern. Thus Vikings from Denmark attacked London in 842, first to plunder and later to settle. 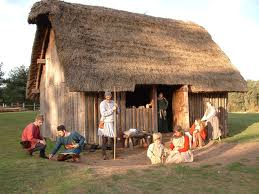 The Anglo-Saxons created a fortified settlement using the remains of the Roman wall. However, the Vikings were able to pass the winter in London in 871-72. They settled increasingly in the North and East of England. The Saxons fought back and after burning the cakes, King Alfred was able in 878 force the Viking leader Guthrum to divide the country. The results of this can still be seen in place names ending in –by (Whitby) and –thorpe (Mablethorpe). However, the attacks began again in the 10th century and in 991 King Ethelred was defeated at the Battle of Maldon (Essex) and was obliged to pay the Danegeld – 10 000 pounds (3,300kg of silver) to buy them off. The battle was described in an Anglo-Saxon poem, but there is a translation as http://www.battleofmaldon.org.uk/. 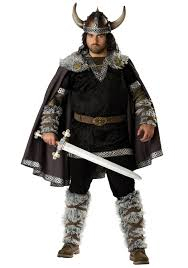 In it the Danish spokesman says: “thou must send swiftly /Ring-money for pledges. For you were it better/That you buy off this spear-rush with your tax,/Than that we should have so hard a battle”. Scholars differ, but it seems that in modern terms, this could have been about 50 million pounds. The result was as warned by Rudyard Kipling 000 years later That “if once you have paid him the Dane-geld, You never get rid of the Dane”. The payments went on for some 22 years. The Danish rule ended when Edward the Confessor became king in 1042. It should be clear from the above that though the Vikings were every much present in the London region, they built no settlements in our region. The River Fleet would not have been suitable for their relatively large, sea-going ships, but It is likely that the St Pancras area would have been a useful source of supply, as it was to the Saxons. And in the earlier stages of the invasions, our opening scenario could well have been all too frequent. 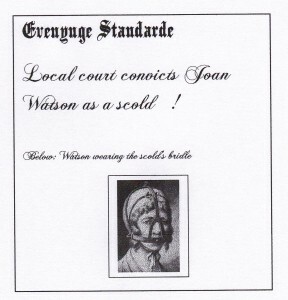 Evenynge Standarde: Local court convicts Joan Watson – “a scold” ! Some bows and some arrows, we’re starting tomorrow”. 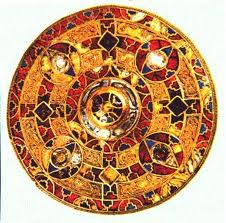 Till Angles and Saxons were all of a dither. In the section above about the Saxons you can read about the invasion of Britain by William the Conqueror and his detailed survey of the country, set down in the Domesday Book. This includes descriptions of the St Pancras area: “plenty of timber in the hedgerows, good pastures for cattle, a running brook, and two 20 pence rents”. The four manors in the area have also been mentioned: Tottenhall, Cantelowes, St Pancras (around the church) and Rugmere. Two of these are of special interest to us. Scholars differ (as they often do ! ), but one of the most knowledgeable about our local history is John Richardson. His history of our area (Kentish Town Past, Historical Publications Ltd, 1997, is detailed and fascinating. He believes that St Pancras Manor was situated “just south of Agar Grove, roughly where the canal cuts under the road, and where in the eighteenth century a mansion called Elm Lodge was built”. In other words, you are probably now sitting right in the middle of the Squire’s drawing room! Mr Richardson’s conclusion about Cantelowes Manor is that it ended up as the first St Pancras Workhuse, and is shown in the picture given here. The photo gives some idea of what it may have looked like in its heyday. The fisherman is trying his luck in the River Fleet (see earlier article above) and “any remains are just south of the canal which skirts the car park of Reachview Court off Baynes Street.” In other words, across the canal from that stretch which acts as a shortcut to Royal College Street. 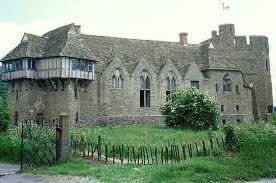 This picture shows how the manor house may well have looked. How Cantelowes Manor might have looked. The court leet dealt with the appointment of officials and misdemenaours by tenants. 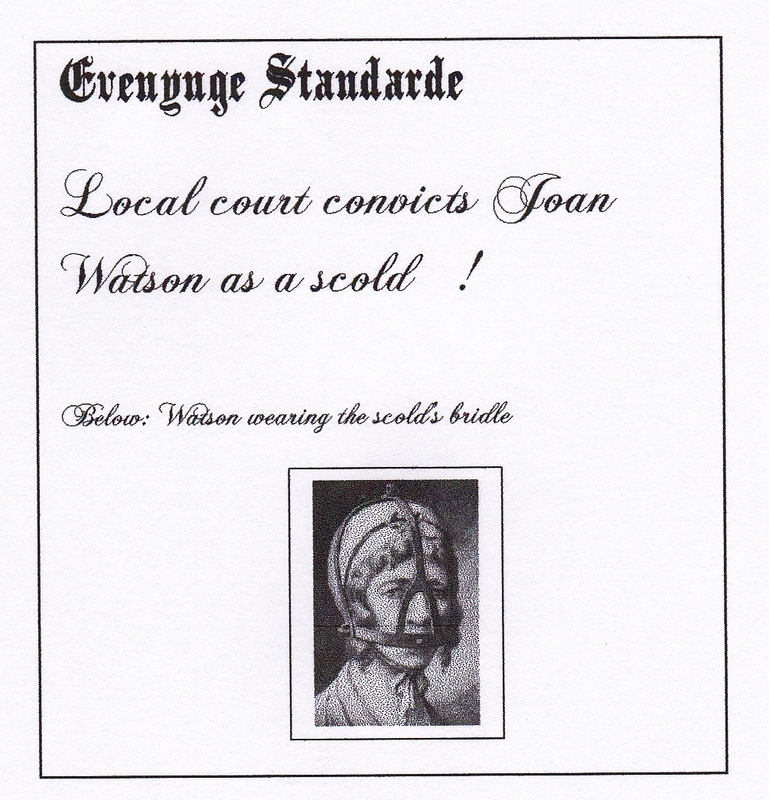 The latter make interesting reading: “The wife of John Watson senior is a disturber and a scold” Though we have no records of serious punishment in the Cantelowes records, Mrs Watson could well have been obliged to wear the “scold’s bridle” pictured here, or could have been ducked in the Fleet, again as illustrated. Many more female miscreants were recorded “….the wife of Giles Eustace, Joan Kempe,Florence Bartram are brewers…. Meg Watson, Joan Wyse and Joan Pecher are common tipplers”.